Halloween is fast approaching. 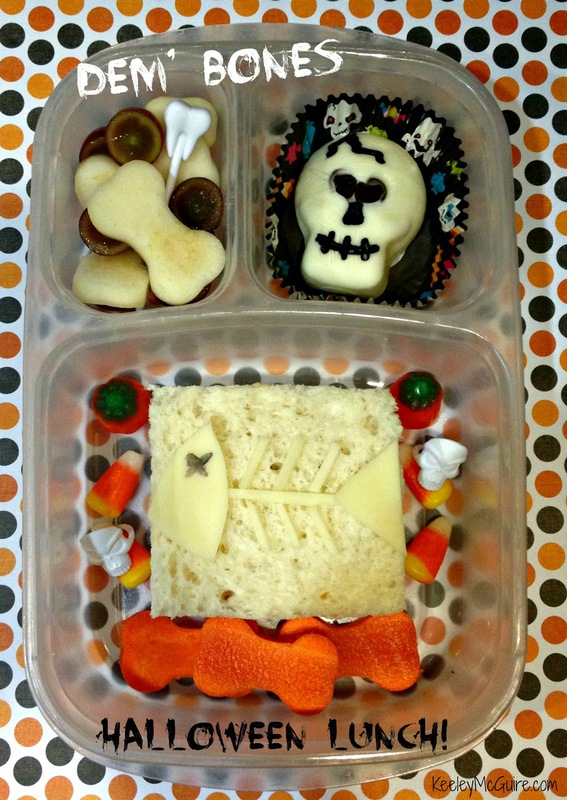 Time to start having some 'holiday fun' with Little Miss' school lunches! Little Miss has a MOMables tuna salad sandwich on Udi's gluten free bread (Udi's is also nut, dairy, and soy free). Fittingly, I made a fish bone skeleton from provalone cheese and placed it ontop of the bread. The "x" for the eye was done with a food safe marker. Rice or vegan cheese could be used for dairy free. Surrounding the sandwich are Sunrise brand candy corn & candy pumpkins. They are peanut free and marked as such right on the packaging ~ I purchased mine at the Dollar Tree. She also had two skull rings. I put rings in her Halloween lunches last year. She loved receiving them every day so she could share with her friends. Below the sandwich are carrots I cut out with my mini bone shaped cutter. Top left are bone shaped fresh pear slices and red seedless grape half 'eyeballs'. She also has a 'tooth pick' to eat them with. Top right is Chobani Champion Honey-Nana Greek Yogurt. I froze it in our Jello Halloween mold. I put two chocolate chips into the mold before pouring in the yogurt, so they would freeze for the eyes. The rest I decorated with black food gel this mornings. You could substitute soy yogurt to make this fun treat dairy free. great lunch! so glad you included a link for the cutters! You are seriously so creative. ahmazing. Doesn't the frozen yogurt thaw by lunch time and look like a blob? I've only frozen the individual tubes because of this. This lunch is awesome! Love the bone cutter :) my favorites of yours are the ones where I'm like, what IS that?! Your girl is lucky to have you as her mama.